The original architectural form is a glass square box. The overall interior design can be seen from the outside of the building and the interior design is totally reflected by the elevation of the building. There are four function areas, multimedia display area, model display area, negotiating sofa area and material display area. The four function areas look scattered and isolated. 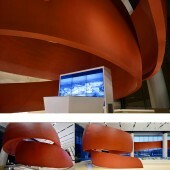 So we applied a ribbon to connect the whole space to achieve two design concepts: 1. connecting the function areas 2. Forming building elevation. 1. Connecting the function areas From the material display area, the ribbon surrounded the negotiating sofa area and flow between the column and glass curtain wall, connecting the model display area, finally flows in heliciform down to the ground while defining the multimedia display area. This make multimedia display area an relatively separate area naturally blended into the overall space. 2. Forming building elevation The original building form of glass box looks empty without a theme. So we add a ribbon into the interior space. 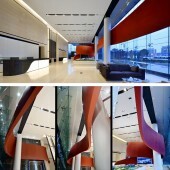 The ribbon can not only connect the function areas but also form elevation of the building through glass curtain wall. It is the highlight of the building. 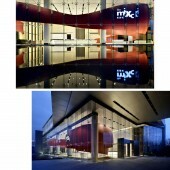 Mix C Sales Centre Real Estate Sales Centre by Kris Lin is a Nominee in Interior Space and Exhibition Design Category. 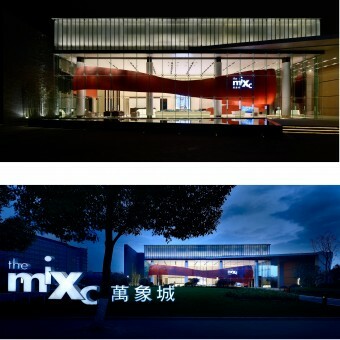 Mix C Sales Centre Real Estate Sales Centre by Kris Lin is Winner in Interior Space and Exhibition Design Category, 2013 - 2014. · Read the interview with designer Kris Lin for design MIX C SALES CENTRE here. 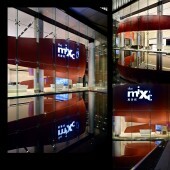 Did you like Mix C Sales Centre Real Estate Sales Centre? Help us create a global awareness for good interior design worldwide. Show your support for Kris Lin, the creator of great interior design by gifting them a nomination ticket so that we could promote more of their great interior designs.